First Times are never supposed to be very good. Awkward, messy, never living up to expectations, it's the reason they make so many movies about them. Fast Times at Ridgemont High, Superbad, American Pie and of course this guy. First times are something one is supposed to laugh and cry about years later usually at a drunken high school reunion. But here I am loud and proud, bragging about my first time just days after the fact. When ever I tell people I live in Sonoma almost the first thing they ask me is "Have you eaten at The French Laundry?" For years I've been able to dodge the answer. "Well, it's in Younteville and we live in Sonoma. That's the other side of the Myacamas" (actually about 12 miles away.) Lame answer. "It's really, really, really, hard to get reservations, nearly impossible." (doubly lame.) That's like "I really, really, like you and of course want you to meet my parents and tell them about us but their schedule is soooo busy." "Those places are really never all they're cracked up to be. It's actually mostly hype." Yeah sure. Well, finally I can say "Yes, I've done it. 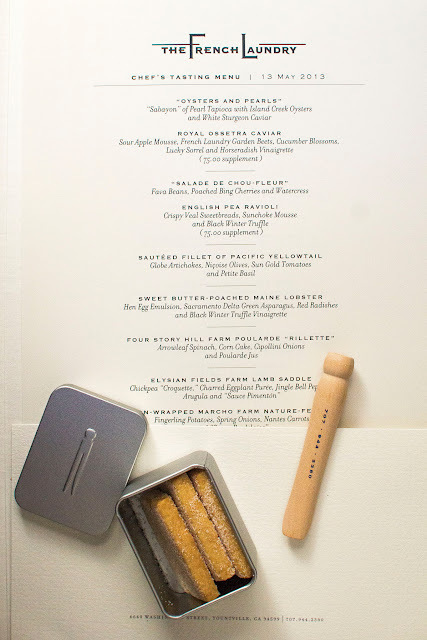 Finally, I've eaten at the French Laundry and yes, it was amazing." We've eaten at a lot of restaurants over the years, the usual suspects in the usual places. Los Angeles, San Francisco, New York, Santa Fe, Sonoma, Santa Barbara. We came, we saw, we ate, and yes I will admit to being a chef groupie. If open kitchens are Woodstock, I'm the one dancing down front with the body paint on X. After eating at a lot of places, over the years I know that I'm not comfortable in hotsy totsy snooty places. I don't need to feel like I'm dining with the Hapsburg emperor in 1897 with waiters hovering around like the Secret Service. I've actually eaten in the restaurant featured in this clip and I felt like I was going to be sent to my room if I made the slightest etiquette error. So, I was nervous when our friends invited us to join them that night. I was nervous. This was a grown up, dress up place. Guys wear ties, girls wear pearls, or at least something nice. I would have to leave my jeans and boots at home. Alan would have to wear a jacket and tie. In LA the only place they really make you wear a jacket and tie is when they're burying you, and sometimes not even then. Most places there are grateful if you're wearing flipflops. This was scary. I was nervous. Not normal nervous, I'm talking Junior Prom nervous. I was afraid that I'd be intimidated by the service, that the staff would make me feel self conscious and that they'd be watching me eat every bite. I was sure I'd feel as though I were an intruder in the palace. I couldn't have been more wrong. First of all, the building is warm and inviting from the outside. After all it was a freaking laundry not Buckingham Palace! We were seated in the upstairs dining room. It's a clean, cool room. Elegantly simple. 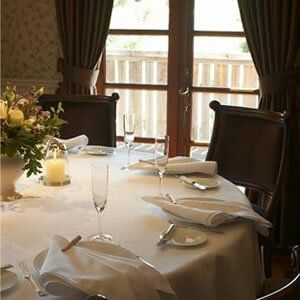 The experience is one of dining in someones' lovely French country house. Not that I'd know anything about that experience but I've seen enough Bunuel movies. So okay, lovely surroundings, calm and soothing. The perfect setting for the perfect dinner with friends. What could possibly go wrong? Turns out nothing. The evening was perfection. The way The French Laundry works is two 9 course prixe fixe tasting menues every day. One vegetarian, one not. The menues are different every day. Many of the ingredients are grown in the garden across the road that one sees from the windows of the restaurant. One of our hosts for the evening is a vegetarian who is also piscatarian, that is, he will eat fish. No problem, they adapted the vegetarian menu to give him a few fish courses for variety. His wife has a gluten allergy and here is where my mind was officially blown. She informed the restaurant about her needs when making the reservation and they came through like champs. Every time we were served something that had gluten in it she was served the very same thing, only the gluten-free version. No fuss, no muss. She was not made to feel "different" because of a food allergy. The creativity and care they took in meeting her dietary needs was extraordinary. I've never seen anything like it. If you have a gluten allergy, you need not fear. You will get great treatment here. I wish I had some pictures to share but the idea of whipping out my iPhone and snapping away at every course set before me just didn't seem right. I just couldn't do it. Of course that didn't seem to stop the couple at the table next to us who seemed to be shooting a virtual photo essay of the evening. The food, the plates, the wine, selfies, each other. The restaurant seemed to be cool with it. Nobody stopped them and I got the idea that it certainly happens often there. 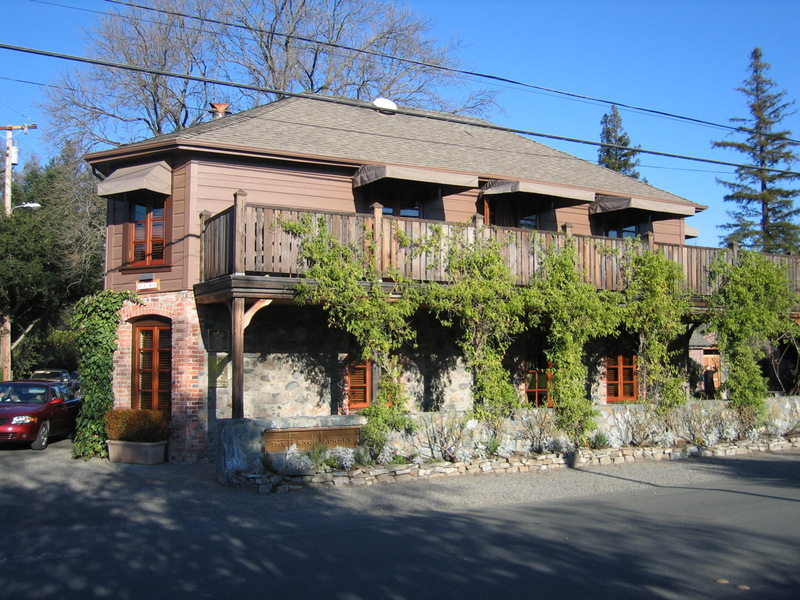 After all it is The French Laundry, one of the top 50 restaurants in the world. Dining at the French Laundry is not a hurried affair. Prepare to spend about 3 hours at table. The menu is a delight to read. The origins of the ingredients are sourced and any questions one needs answered are capably handled by the waitstaff. I'd give you a menu link but it since changes every day I can only tell you what I had on Monday evening. We moved through the various courses, each small plates exquisitely prepared. Of course wine was ordered. I don't drink, but Alan and our friends enjoyed a bottle each of Domaine Bonneau du Martray Corton-Charlemagne Grand Cru and Domaine Meo-Camuzet Les Chaumes, Vosne-Romanee Premier Cru. Okay , I have no idea what any of that is but let me say they were all very well pleased with their selections. I can highly recommend the sparkling water. After all of that food, I expected to receive the dessert that we had each selected before the meal started. Not so fast, the fun wasn't even close to over. After dessert the staff asked us if we'd like coffee or tea. Strange I thought, usually coffee is served with dessert. Alan and Terri ordered Cappuccino, Chip and I ordered mint tea. A few minutes later the waitstaff appeared carrying trays of small cappuccino cups. I was about to announce that a mistake had been made I didn't order this cappu.....when what the hell.....it wasn't coffee at all. It was another dessert. 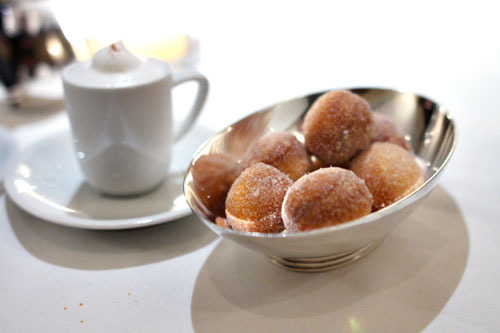 The French Laundrys' famous "Coffee and Donuts" a Cappuccino Semifreddo with Cinnamon-Sugar Doughnuts. Oh yes they did! The mint tea arrived after that along with a wooden box that looked like a humidor, inside was a selection of amazing hand crafted chocolates. Quickly they were joined by a bowl of candied Macadamia nuts, and a bowl of wrapped chocolates. The bill was settled; gratuity was included in the price. As we prepared to leave our servers gave each of us a small silvery box, filled with cinnamon shortbread cookies to take home "for later". Terri was given the cookies, to take home to the family and a packet of gluten free chocolates for herself. And so we wandered out into the warm Spring evening, well fed, but not uncomfortably stuffed. Four totally blissed-out, contented diners hit the road back to Sonoma. I can truly say that the experience at the French Laundry is worth every penny. I have never, ever, had such a dining experience in my life. I'm very grateful to our friends Chip and Terri for treating us to this wonderful culinary experience. It was pay back for a culinary favor. Back in 2011 they happened to hit the crappy times jackpot. She was very seriously injured in a horseback riding accident just months after discovering she had a gluten allergy, and within two months of that he (a vegetarian) was diagnosed with thyroid cancer. Having been there myself 23 years ago, the cancer part not the horse part, I offered to do cooking for the both of them during their treatment. Since a lot of Indian food is gluten free, naturally that part was fairly simple. His treatment however was a bit trickier. Because of his treatment he had to abstain from anything containing iodine. I had no freaking idea how many things iodine was in. Dairy? Iodine. Fish? Iodine. Bread? Unless it's made with kosher salt, iodine. Iodine seemed to be everywhere. Following a booklet from his doctors at UCSF I developed a menu of vegan, iodine free Indian foods for him, and baked artisan bread for him weekly since that uses Kosher salt which is iodine free. I loved finding solutions to his food cravings during those months, and especially dishes which they both could enjoy. 2 Years later I'm glad to say that with everyone healthy and happy once again, we celebrated with this wonderful meal. I'm definitely planning on going to the French Laundry once more, because as James Bond used to say. once is not enough. Wow! So glad you went. I am so happy no pictures of food was taken. Two things that were slightly different from your experience: no dress code here, there is always a mix of people who are dressed from the everyday comfortable jeans or whatever to in their tees, as they wish. Those two courses that were extra charge. If it is a tasting or any other kind of menu, I have never had those "pay extra" items here. The one I know are Akelare, Arzak, Asador Etxebarri, Mina, Solana, Cenador de Amos, Azurmendi, Zortziko. And all of them have been worth every penny. But we have still a few more left to try out!